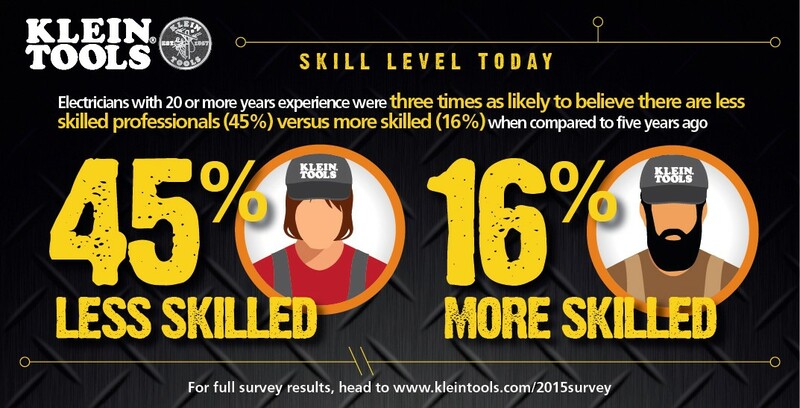 April 27, 2015 (Lincolnshire, IL) – Klein Tools (http://www.kleintools.com), for professionals since 1857, today announced the results of its 'State of the Industry' survey. 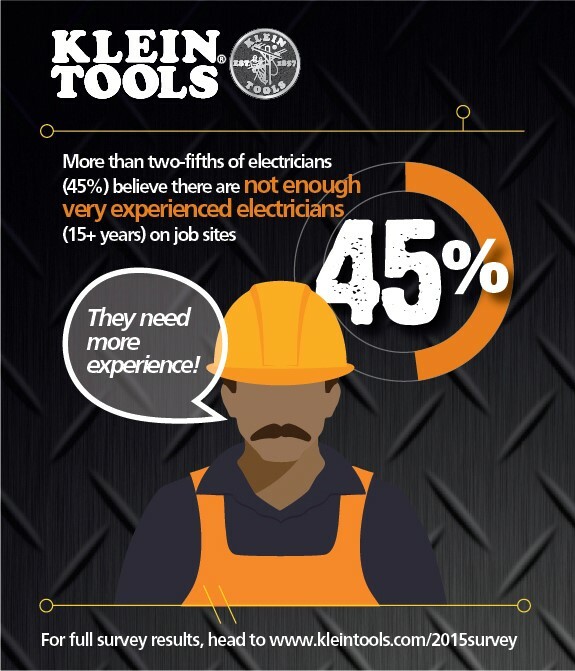 Klein Tools asked hundreds of electricians across the country for their thoughts on hot-button issues like training preferences for experienced and non-experienced electricians. Differences between union and non-union electricians were highlighted for analysis and comparison. 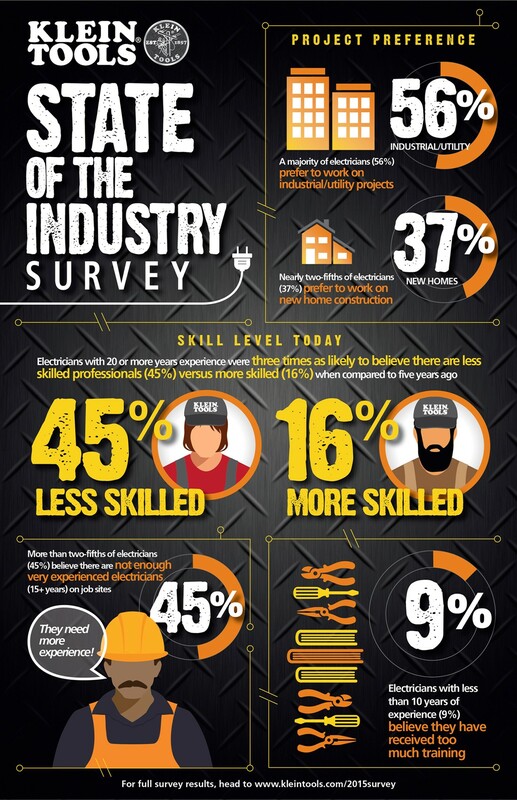 However, nearly two-fifths (37%) believe there are also not enough entry level electricians at job sites. Electricians with 20 or more years' experience were three times as likely to believe there are less skilled professionals (45%) versus more skilled (16%) when compared to five years ago. More than two-fifths of electricians (45%) believe there are not enough very experienced electricians (15+ years) on job sites. A majority of electricians (55%) believe 1,000 or more hours of training is necessary to becoming an effective electrician. Meanwhile, over three in five electricians with 20 or more years of professional experience (62%) have received 1,000 or more hours of training. However, more than one-half of electricians with less than 10 years of experience (55%) believe less than 250 hours of training are necessary. And one in 10 (9%) of this group believe they have already received too much training. "Electricians are at a renaissance as new technology constantly replaces old standards and practices," said Mark Klein co-president of Klein Tools. "Electricians need to be up-to-date both with the latest products and also the newest building practices so time in the classroom and also on the job site is critical. 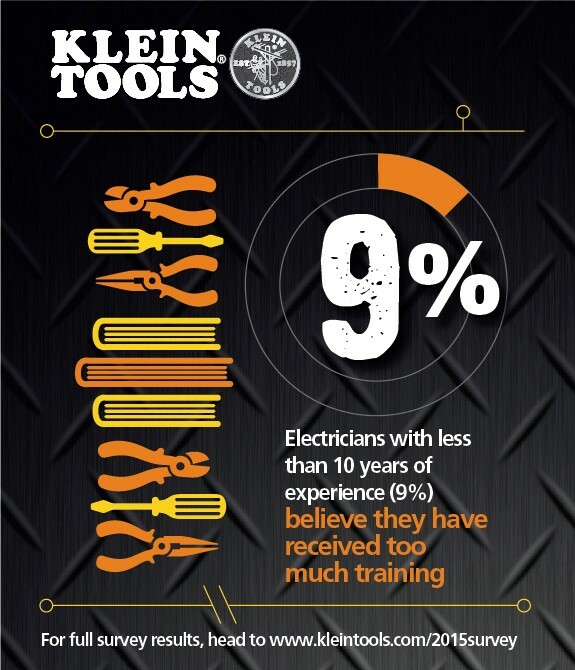 Klein Tools works hard to keep tools and materials up to date so electricians of all generations can rely on quality products when they put all of their training to use." The Klein Tools 'State of the Industry' survey was conducted by Russell Research, an independent survey research firm, which conducted 201 online interviews from January 20 – 26, 2015 to secure a nationally significant representation. Forty percent of respondents were union members and 60 percent were not. An infographic visualizing these statistics is attached below.